The New IQ: Fisher-Price International Study Reveals Today's Moms Highly Focused On Developing Their Child's Character As Much As Intelligence | Mattel Inc.
NEW YORK, Sept. 24, 2015 /PRNewswire/ -- Happy, kind, honest, respectful and polite. Surprising to some, those are the most important qualities today's moms want their children to achieve in life. These were rated over traits like success, leadership and intelligence, according to the Moms' Hopes & Wishes Study released today by Fisher-Price, Inc., a global early childhood development company and a subsidiary of Mattel, Inc. 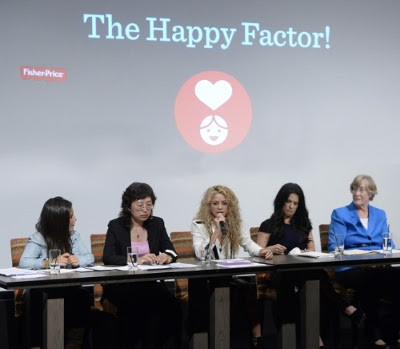 The study was presented at a forum convened among international experts and advocates in early child development, including mom, philanthropist and global pop singer, Shakira. "As we talk to new parents worldwide, it's clear that children's happiness and feelings of being loved are of primary importance," saidJean McKenzie, EVP of Fisher-Price Brands. "There's more that unites moms around the world than divides them, especially as they welcome a new life. This further validates what we observed during the making of our Wishes for Baby viral film earlier this year. The sentiment we see here seems more pronounced than ever among millennial parents, who are striving for a balance of intellectual and emotional intelligence - or IQ and EQ - as they help their children reach their unique potential." "EQ, or emotional intelligence, is the ability to understand emotions in oneself and others, and to use that understanding to achieve positive goals," said Sara Harkness, Professor and Director of the Center for the Study of Culture, Health and Human Developmentat the University of Connecticut, and consultant on the survey. "Although traditional IQ is important for learning new information and thinking analytically, people with high emotional intelligence have an easier time making and keeping friends, and they are also more likely to be successful in school and at work." The Moms' Hopes & Wishes Study, conducted by Illuminas Global on behalf of Fisher-Price, measured parental attitudes and approaches to Early Childhood Development with 3,500 new and soon-to-be moms in seven countries. Though findings indicated more similarities in beliefs than differences, the study highlights cultural nuances, or 'parental ethnotheories,' apparent in specific countries. For example, one question asked, "What qualities are important for your child to achieve?" In response, Chinese moms in the survey valued grit/tenacity, Brazilian moms said environmental awareness, and Russian moms chose athleticism. Another question asked moms what level of agreement they had with the notion that development begins at birth. This resulted in a wide range of responses, with the highest level of agreement from Russia, France, and the U.K.
"It's been proven that development begins at birth, and parents can greatly impact their child's future success in the early years just by loving and engaging with their child every day," said Shakira. "Through the work I've done with my Barefoot Foundation, I've seen parents make a big difference in their child's healthy development through the daily practice of things like reading to them, talking, singing or even simply playing. We as parents are their first teachers and it's never too early to start." Shakira also previewed her parenting app, Grow, for post natal moms. The app features 2,000 tips including play ideas, mini articles and activities customized to a child's age to foster early childhood development from birth and through age five in a fun and easy way. The app also features a timeline to track developmental milestones with the ability to share out with friends and family. The app will be available later this fall. "We want to engage moms around the world on their views of early childhood development, and this study is just one of the ways we hope to spark conversation with parents and the organizations and communities that support them," said McKenzie. "It's part of living our promise to help enrich the lives of families with young children." This event is part of the Company's ongoing Best Possible Start campaign aimed at elevating the importance of early childhood development to the new generation of parents. The Moms' Hopes & Wishes Study was conducted during a four-week period between February and March of 2015, across various socio-economic groups, with more than 3,500 moms between the ages of 21-40 years old. Fifty percent of the participants were first-time, pre-natal moms; the rest were first-time moms of a single child, 0-18 months old. Local surveys were conducted online or in-person across seven countries, including China, Brazil, Mexico, Russia, France, the United Kingdom, and the United States. TheMoms' Hopes & Wishes Study marks the largest pre-natal research Fisher-Price has conducted to date. When asked about the opportunities their child will have to fulfill their potential compared to the opportunities they had, moms in five out of seven countries felt their children will have it better, with over 80% percent agreement in China, Mexico and Russia. What made moms feel optimistic about bringing up baby? Access to education was the number one answer across all countries, even above considerations like safety in the community, clean water, access to affordable healthcare and "my ability to provide." All countries have high agreement that "A parent's relationship with baby is the foundation of healthy development." However, it wasChina and Brazil that felt strongest that "My children can learn most through their interactions with me." Roughly half of moms surveyed felt it's important to push children to reach their full potential, and for their children to reach milestones quickly and ahead of others. This was especially evident in Brazil and Mexico, followed by China. However, regardless of their differing perceptions on parenting, nearly all of the moms surveyed agreed that the most important thing to keep in mind for a child's healthy development is to "Let children be children." The study revealed that moms are definitely engaged in play with their child. In fact, one of the top-ranked parenting attitudes was "Play is the way children learn naturally." In 1931, Herman Fisher and Irving Price embarked on a journey to change the toy industry. Their goal: creating playthings that inspire a child's development. More than 80 years later, Fisher-Price remains deeply rooted in the belief that play is the way children learn best. To this day, understanding the importance of play in building a child's skills is the fundamental principle, as the company strives to enrich the lives of families with young children around the globe. United by the passion for a child's safe care and development at each age and stage, the people of Fisher-Price work tirelessly to bring families the best toys and baby products in the world. Some of the company's best-known brands include Laugh & Learn®, Little People®, Power Wheels®, and Imaginext®. Fisher-Price is a subsidiary of Mattel, Inc. (NASDAQ:MAT). For more information, visit www.fisher-price.com (U.S.) and www.fisher-price.ca(Canada) or connect with Fisher-Price on Instagram, YouTube, Facebook, Twitter or Pinterest.